steemed friends of audiophile music, the concert grand piano is incontestably the king of instruments. I could now wax lyrical about its incomparable dynamics and go into its ability to go from the tenderest of sounds in a soft minor key to the magnificent power of a fortissimo, or I could rhapsodise about its impressive size and elegance. But what makes this instrument really fascinating is its individuality, since each one is unique in itself - created by a master. A concert grand has a life all of its own that a virtuoso can really "get into" and hence bring the work of the composer to life. In our Grand Piano Masters series, we get into the character and soul of the concert grand piano and experience, during the performance itself, the dialogue between the instrument, the virtuoso and the performance space. Appassionata - appassionato (passionate, impassioned) - passione (passion), to have a passion for something, to be a passionate artist, going to the limits of suffering for the sake of it, not because of the benefits. I might perhaps also mention the word 'calling' here, the passion that is the prerequisite of mastery. For, esteemed friends, which of us today still feels himself called to do something and is prepared to live for that calling? To wander up to the heights and down into the deep valleys, to accept setbacks, other people's lack of understanding, personal sacrifices and much, much more? The young virtuoso in his prime and with all his charm must first be polished year after year in order to become a glittering diamond - a true master. For what distinguishes a master is the passion, the fervour and, above all, the experience. I like youthful "Sturm and Drang", as you no doubt also do - it comes at us like a breath of fresh air, irrepressible and powerful. Yet when that first fame evaporates, when you've played the big houses and the euphoria of the moment inevitably ends up back in the same old rooms? What then? Then you need love, unconditional passion and a deeply felt calling to make it to true masterdom. This particular recording is of a concert by a true past master who has "been there and done that" and who is now conveying and passing on her experiences and artistic merit to the up-and-coming generation. Lilya, with all her humaneness and virtuosity of performance, has crossed the boundary into that space where pride is refined into modesty, with the result that what is being played is measured against how it is conveyed to the person instead of against the preordained perfection of the music aristocracy. he path that Lilya Zilberstein has taken reflects the triumph of a calling, a dogged determination to overcome obstacles that would have shattered any other talent: the eighties in the USSR were times of overt, yet unofficial antisemitism. Despite all the first prizes won at important Russian and Soviet competitions - at the Russian Federation's 1985 competition, for example - she was told in no uncertain terms that she was persona non grata at the Moscow Conservatory because of her Jewish origins. Permission to take part in international piano competitions was withheld, in particular when it came to the International Tchaikovsky Competition. The one exception to this in 1987 was more of a coincidence than anything else: she was given permission to take part in the Busoni Competition in Bozen. Her triumph there was a sensation, and five years passed before a first prize was ever awarded in Bozen again. Her debut in the West marked the turning point of Lilya's career, and experts in the music branch pricked up their ears. By August 1998, she had received the International Accademia Musicale Chigiana Prize in Siena. Holders of this award include Gidon Kremer, Anne-Sophie Mutter and Krystian Zimerman. Fast on the heels of this honour came extended tournées in numerous countries throughout Western Europe as well as an exclusive contract with Deutsche Grammophon. Since that time, Lilya Zilberstein has been a presence on the great stages of the world. In 1991, she debuted at the Berlin Philharmonic with Claudio Abbado conducting, which laid the foundations for repeated collaboration between them. She has participated in concerts with the most renowned international orchestras, including the Chicago Symphony Orchestra, the Moscow Tchaikovsky Symphony Orchestra, the London Symphony and Royal Philharmonic Orchestras, the orchestra of Milan's La Scala and many, many more. Besides Claudio Abbado, she has worked with conductors such as Paavo Berglund, Semyon Bychkov, Christoph Eschenbach, Vladimir Fedossejew, Dmitrij Kitajenko, James Levine, Marcello Viotti, Hugh Wolff and Michael Tilson Thomast. Deutsche Grammophon and Lilya Zilberstein have produced legendary CDs. A particular highlight is the benchmark recording of the Rachmaninov Piano Concertos with Claudio Abbado and the Berlin Philharmonic. And in addition to her career as a soloist, Lilya Zilberstein is a passionate performer of chamber music and works with the great soloists of the day. The piano duo of Martha Argerich and Lilya Zilberstein has been highly acclaimed all over the world for many a year now. Over and above this, she regularly goes on world tournées with violinist Maxim Vengerow. The international press agrees on one thing: there is no superlative too good for her! Lilya Zilberstein belongs firmly in the circle of those magical sorcerers of sound on the piano. The level of tension in the entire sonata is remarkable; even the middle movement seems to see the with repressed energy. The early Piano Sonata No. 2 in A major, Op. 2, No. 2, is equally strong, with a unique rhythmic conception of the main theme. 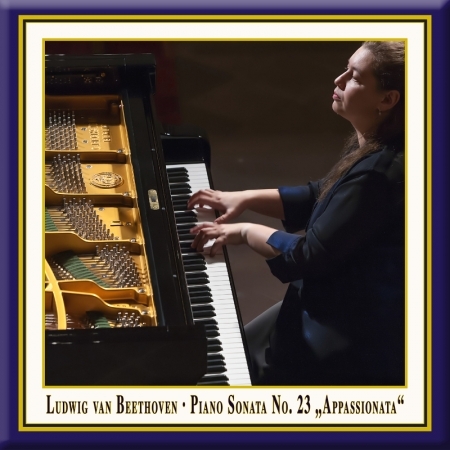 Just sit and listen: even among all the Beethoven sonatas on the market, this one stands out.